A company that specializes in selling to servicemembers -- and financing those purchases -- has settled state and federal charges that it used illegal debt collection practices. Freedom Stores, Inc. settled lawsuits filed by the states of Virginia and North Carolina and the Consumer Financial Protection Bureau (CFPB) and agreed to pay over $2.5 million in consumer redress. The CFPB alleged that Freedom Stores, Inc., Freedom Acceptance Corporation, and Military Credit Services LLC used illegal tactics including filing illegal lawsuits, debiting consumers’ accounts without authorization, and contacting servicemembers’ commanding officers. In a statement, the company said it supported the CFPB's "effort to root out the bad actors in this space." "Freedom Stores has voluntarily agreed to forgive more than two million dollars in loans and provide more options regarding where default litigation will be conducted. In addition, we are redoubling our efforts to educate customers on money management fundamentals through our online MoneySKILL course," said Elizabeth Heaton, a spokeswoman for the company. "We have also put new safeguards in place to ensure customers are charged for loan payments only as expected and will be creating a blue ribbon internal advisory board of former military personnel and other experts who will help guide our policies." 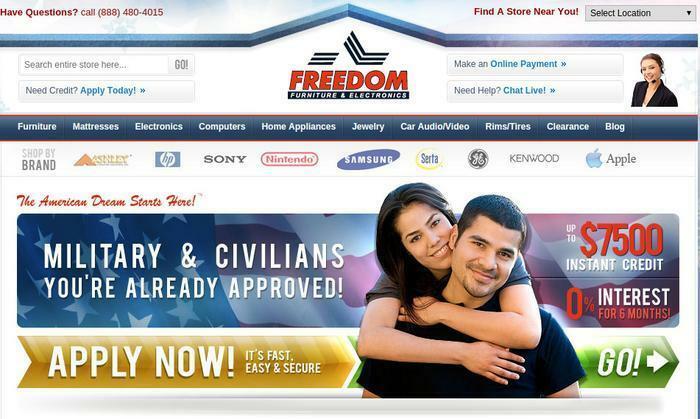 Freedom Stores (also known as Freedom Furniture and Electronics) is a Virginia-based furniture and electronics retailer that caters to U.S. military members with stores located near military bases nationwide. Freedom Stores offers credit to consumers purchasing its merchandise and transfers the contracts to an affiliated company, Freedom Acceptance Corporation. John Melley and Leonard Melley, Jr., the company's owners, also own Military Credit Services, which provides financing for purchases made at over 300 independent consumer-goods retailers, primarily catering to servicemembers. Illegally filing thousands of lawsuits in Virginia for out-of-state contracts: From July 2011 to December 2013, Freedom Acceptance Corporation and Military Credit Services filed over 3,500 lawsuits in Norfolk, Virginia against consumers who had not signed their financing contracts in Virginia and did not live there when the suits were filed. Almost all of those lawsuits resulted in a default judgment, after which the companies garnished the consumers’ wages or put liens on their bank accounts. Some consumers did not even know they had been sued until they discovered their bank accounts had been drained. Double-dipping into servicemembers’ funds: Most of Freedom Acceptance’s and Military Credit Services’ customers sent their payments via military allotment, but the companies also required consumers to authorize withdrawals from a bank account as a back-up payment method. Because the companies relied on reports from a payment processor that were sometimes incorrect, many consumers had their payments taken from both their paychecks and their bank accounts in the same month, often without their knowledge and before the payment due date. This caused many servicemembers to pay unexpected overdraft fees and non-sufficient funds charges. Contacting commanding officers to pressure servicemembers into repayment: A clause buried in the fine print of the purchase contracts required servicemembers to allow Freedom Acceptance and Military Credit Services to contact their commanding officers about their debt. The companies would contact the officers in writing and by phone to disclose the debts, humiliating the servicemembers and putting their careers at risk. For members of the military, consumer-credit problems can result in disciplinary proceedings or lead to revocation of a security clearance. Illegally debiting bank or credit card accounts of consumers’ family and friends: Collectors for these companies withdrew funds from checking accounts and credit cards of consumers’ parents, significant others or other individuals without prior authorization. The problem would start when a parent or other third party would authorize a one-time payment on a consumer’s behalf. The companies would keep the payment information in their systems, and then debt collectors would later take funds from those accounts without authorization or notification.